Good Salad (sorry, Zalad)Great place for some wings and things.Always a fresh salad, very clean restrooms and very reliable service.... of fries, side of their house chips, and a small order of boneless wings. 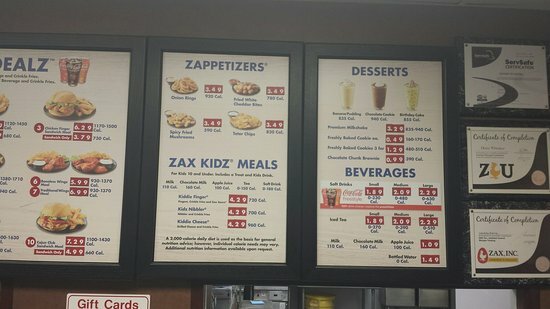 My son has always liked chicken, so it was no surprise that Zaxby's met with is approval. Despite being a "chicken place," here is a good variety on their menu and the prices are reasonable. Great place for some wings and things. Service good and so is the food. Beats that bojo chain hands down. I love the salads and our little grandson loves the chicken and rice and the bread. It is his favorite place to eat so we have to take him and we get to enjoy the food too.